Little kids are just so adorable. It doesn’t really matter what they’re doing, we can look at them for hours just because they’re cute. So, when a little kid does something silly, funny or downright amazing, everyone pays attention. There are countless videos of kids on talent shows, talk shows, and YouTube, but only a fraction of these have actually gone viral. Here are the 15 kids who became viral sensations (with videos that have over a million views) thanks to their witty personalities, jaw-dropping talents, and crazy antics. Kai Langer’s mother uploaded a video of him singing a very emotional version of Bruno Mars’ Grenade in 2013 and it caught the attention of the one and only Ellen DeGeneres. The television host soon invited the adorable (then four-year-old) kid to her show and he stole the heart of audiences everywhere. Ellen continued inviting him to her show and the videos of him singing loudly with his eyes closed and hands gesturing have since gone viral. One of the videos of Kai singing Bruno Mars’ When I was Your Man to Ellen (who he says is his girlfriend) has garnered over 30 million views on YouTube. He even met and sang with his idol, Bruno Mars! This cutie is definitely going places and we can’t wait to see what he does next! Let’s go way back to 2006, when a Swedish father decided to upload a video of his adorable baby laughing in the kitchen. The blue-eyed, blond-haired baby’s name is William Nilsson. The video opens with the Swedish text, "kan man ha roligare" which translates to, "Can you have any more fun?" In the video, which is just under two minutes long, the father makes sounds which the baby reacts to by laughing hysterically. It’s just too adorable and his laugh is so contagious, you’ll just want to watch this video over and over again. It’s no wonder that it has over 24 million views on YouTube! At one point in time, it was the tenth most-viewed video on YouTube and was even shown to Queen Elizabeth II during her visit to Google headquarters in 2008. Most little girls love pretending that they’re a princess, but not Joanna “Jojo” Lomelino. The sassy little girl goes on for almost four minutes explaining to her dad why she’s not a princess after he calls her one. She explains that princesses have prettier dresses than hers and wear sparkly bracelets and headbands. When her dad interrupts her, she says, “I said don’t ask me anything or don’t talk, you can talk after.” The attitude is real! Is she sure she’s not a princess? She even tells him, “You need to watch a video of princesses, because you don’t know how princesses look.” The video went viral with over 2 million views on YouTube and Steve Harvey invited her to the show, Little Big Shots, which made her even more popular. Ever wanted to know what the world’s happiest and most enthusiast kid looks like? Watch this video of Heavenly Joy Jerkins, who appeared on Little Big Shots. Steve Harvey interviewed the adorable curly-haired six-year-old, who refers to her mom as “the girl with the hat on” and calls her aunt out for being the one who burps loudest in the family. And she does it all while smiling—living up to her name, Joy. She also appeared on America’s Got Talent in 2015, singing "In Summer" while tap dancing. During the audition, she said that if she wins a million dollars, she’ll want it to go to all the people around the world that don’t have clothes. The video went viral, with over 19 million views on YouTube. Many people think Heavenly is the next Shirley Temple and she may just be with that talent and adorable face to match! A lot of kids like to cry or argue so that they can get their own way. Well, we’ll bet that you’ve never seen a kid argue like three-year-old Mateo does! His mom told him that he couldn’t have any cupcakes, so he went to his grandma to ask her for some. When his mom got mad at him, he keeps on saying, “Linda, honey, listen!” It’s absolutely hilarious and adorable watching him because the things he says are what an adult would say, but he can’t even pronounce his words properly. Apparently, Mateo calls his mother by her name when he’s serious. He learned to call her “honey” from his father. The cute video has over 47 million views on YouTube! Of course, Ellen DeGeneres also invited Mateo onto her show and made his wish come true by giving him a bunch of cupcakes. In 2014, seven-year-old Elias met Ellen DeGeneres and became one of her most memorable guests. Not only is he a well-dressed piano prodigy that’s played at Carnegie Hall, but he has an eye-catching personality to match. There has probably never been a kid more excited to meet Ellen than Elias. He constantly jumps out of his seat, tells her that she’s a beautiful person, and even touches her hair, saying it’s soft and suggesting that she should never put gel in it! We don’t know which segment of the video is better—his eccentric personality or him playing the piano flawlessly. The video of his first appearance on Ellen has over 7 million views on YouTube. He even went on to compete on America’s Got Talent with his brother, Zion. You can watch their audition here. Yasha and Daniela appeared on season 8 of America’s Got Talent when they were nine and eight years old, respectively. They are amazing samba dancers, doing flips and spins better than dancers twice (or even triple) their age. They’ve both been dancing since they were three years old! Daniela even makes some sassy faces while she dances. The talented duo received a “yes” from all four judges during the auditions, to no one’s surprise. But, what makes the clip even better is that Yasha says that Daniela is bossy and we see evidence of that. He also suggests that when they get older, they will be boyfriend and girlfriend, but Daniela’s facial expression shows that she thinks otherwise. The video currently has more than 28 million views on YouTube. Charlie and Harry Davies-Carr are the stars of their own viral video, once known as YouTube’s most viewed video. It currently has over 842 million views on YouTube! Let that sink in for a minute. That’s more than Beyoncé’s Crazy In Love! The 2007 video even won a VMA in 2014! 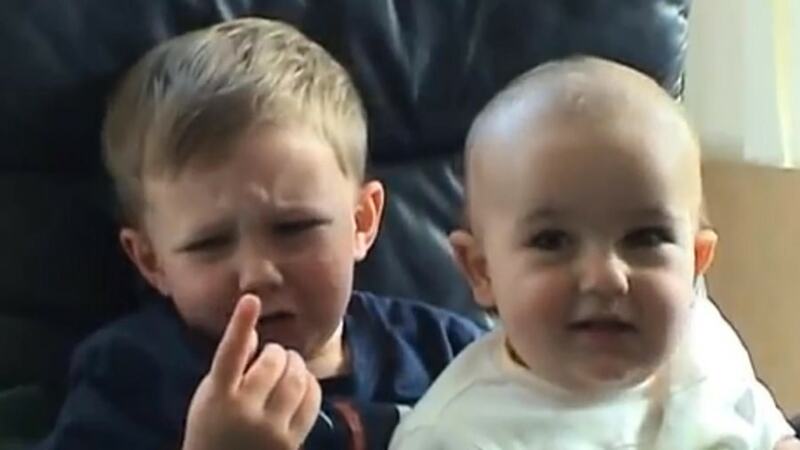 The 56-second-long video features the two brothers (aged three and one), sitting on a couch when Harry, the older brother, puts his finger in Charlie’s mouth and gets bitten. Harry states the obvious, “Charlie bit me,” then puts his finger in his brother’s mouth again! Charlie bites him harder and begins to giggle. The video is so simple yet so funny and cute, you can watch it a few times in a row without getting bored. Sophia Grace and Rosie are the poster children for viral sensations. Their first popular video, in which they danced to and rapped/sang Nicki Minaj’s "Superbass," was uploaded in 2011. It gained over 51 million views on YouTube. But, it didn’t stop there for this talented duo. In fact, that was barely the tip of the iceberg. They were invited onto Ellen’s show to sing with Nicki Minaj (that video has over 100 million views on YouTube) and countless other times. They even became correspondents at several red carpets and secured their own segment on The Ellen DeGeneres Show, called Tea Time with Sophia Grace and Rosie. The cousins then went on to appear in television shows and star in their own movie, Sophia Grace & Rosie’s Royal Adventure. In 2009, David Devore Jr.’s father uploaded a video of his son after a trip to the dentist (which involved anesthesia). In the video, David Devore Jr. is a bit woozy and asks, “Is this real life?” He also looks at his two fingers and tells his dad that he sees four fingers. And when his dad tells him to sit down, he lets out the most epic scream (which has actually gone on to become a meme). The video has gained over 133 million views on YouTube and has earned the family over $100,000 from their YouTube partnership. They’ve even been invited onto the Today Show, Tyra Banks Show and The O’Reilly Factor because of the hilarious video. Not bad for a trip to the dentist. There are a lot of adults out there who can’t remember the choreography for an entire song, so when a two-year-old does it, it’s bound to amaze everyone. Tianne King is a choreographer from New York who noticed that her two-year-old, Heaven, has some serious dance skills. She posted a video of her and her daughter dancing to Beyoncé’s "End Of Time," and it went viral, reaching over 23 million views on YouTube. It caught the attention of—you guessed it—Ellen DeGeneres and it all took off from there. Heaven and her mom eventually got the opportunity to meet Queen B at one of her concerts. They also appeared on Ellen a few more times and Heaven was even featured in Silento’s music video for "Watch Me (Whip/Nae Nae)." We’re sure that when a baby or child around you is crying, you do everything in your power to make them stop—make silly faces, give them toys —but you’ve probably never thought of playing them a Katy Perry song. That’s right, apparently, "Dark Horse" has magic powers that makes crying infants stop instantly. If you don’t believe us, just check out the video of this adorable baby who was crying in her car seat when someone turned on the song, prompting her to laugh and dance. On YouTube, the video has over 2 million views but the miracle-worker herself, Katy Perry, also shared the video to her massive Twitter audience, writing “Available for babysitting at 10 dollars an hour & 4 Oreos.” That’s just priceless! We were all a little heartbroken when we found out that the Maroon 5 heart throb, Adam Levine got married. But, were you really heartbroken? Like, so heartbroken that you threw a bit of a tantrum? Well, there was one little girl who just couldn’t handle the news. 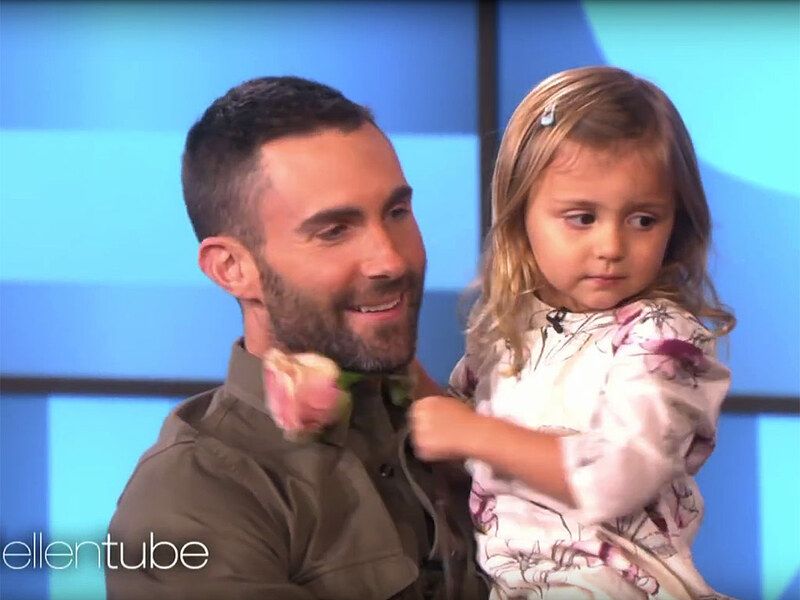 When three-year-old Mila was told by her mother that Adam got married, she cried and screamed, “No, mommy! Mommy, he didn’t!” it was only a 21-second long video but you could really tell how upset she was that the love of her life got away. Luckily for her, the video caught Ellen’s attention and Mila met Adam in person. Though, she didn’t seem too excited about it. Maybe she was too shocked. Or maybe she just needed to get some closure. John is just three years old, but he knows how to keep a straight face when he’s lying. That’s probably not the best skill to have... but it sure made for an entertaining video! His mom caught him with sprinkles all over his face and when she asked him if he had any snacks, he says, “Nope” and even opens his mouth for her to see. She then goes into the kitchen and sees that the jar of sprinkles is almost empty. So, she asks him why they’re like that. John is just too clever because he responds with, “Well, they’re not empty.” True, kid, true. Don’t be surprised if this kid ends up being a world poker champion. The hilarious video has gained over 5 million views on YouTube, and it’s reported that John finally admitted to eating the sprinkles and also learned not to lie.